The new term will start on Saturday, 06/09/2017. All students should arrive the Boroughmuir High School at 9:00am. The list of classes and teachersand the fee and payment instruction for 2017-18 have been updated. Please check the information, and donate the suggested amount before 02/09/2017 to ensure the school to order the text books for your children. The Annual Geneal Meeting (AGM) was held on 17.06.2017. Dr. Erfu Yang was elected as the new headmaster. He has appointed the new school management committee. More details of the new school management committee is in committee section. Edinburgh Chinese New Year Concert 2017 was held in the Usher Hall on 25th of January. 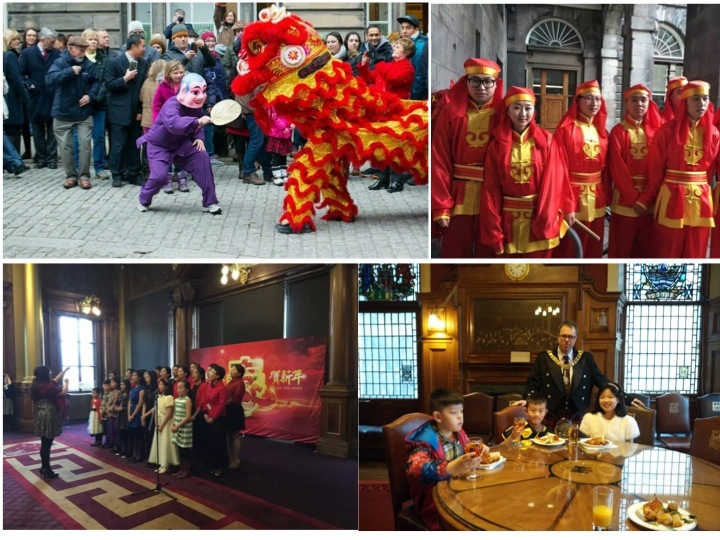 The concert was organized by the Euro-Asian Association and our school, with support from the Chinese Consulate General in Edinburgh, Edinburgh Mayor, Bank of China, the Confucius Institute in Scotland. 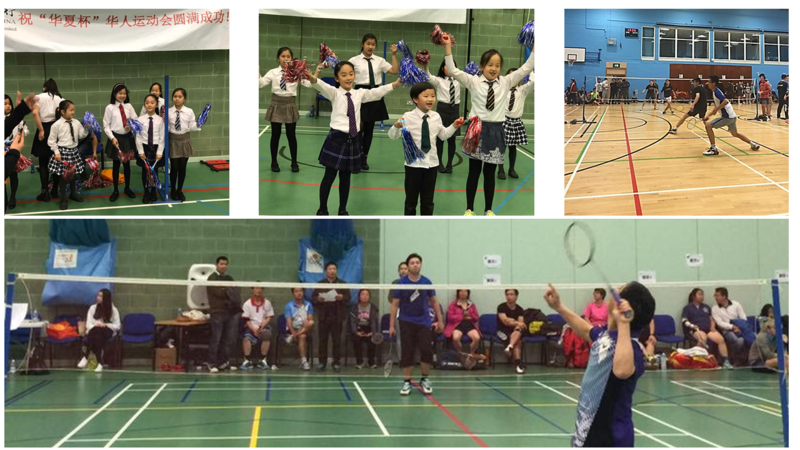 From 5th to 6th November , our school for the first time participated in the annual “Huaxia Cup” Scottish Chinese Sports Games by sending two badminton teams and girls cheerleaders to the Games . The “Huaxia Cup” Scottish Chinese Sports Games 2016 was held in Edinburgh. Dozens of teams from Edinburgh, Glasgow, Dundee, Aberdeen, Stirling competed in sports such as basketball, badminton, Table tennis and other group sports. Although it was the first time for our players to participate the game, they were brave to face strong opponents, and achieved their best results. Especially the 10 young cheerleaders were eye-catching. Dressed in white shirt and black stockings and accompanied by music, they constantly danced to cheer up the athletes and applause for the winners. On 10th September, the first “Wan-mei Distance Training Program for Chinese Language Teachers” opening ceremony in the UK was held at our school. The “Wan-mei Distance Training Program for Chinese Language Teachers” was administrated by the Chinese Language Education Foundation, organized by Beijing Fourth High School and sponsored by Wan-mei (China) Limited. Since 2006, the program has been launched in 23 countries, 165 overseas Chinese schools. After the opening ceremony, teachers from our school watched a wonderful HD class on “Introduction and Guidance to the YCT exam”. Our school has chosen 30 HD courses to offer to our teachers with variable topics such as “How to Organize Listening and Speaking in Class”, “Introduction and Guidance to the YCT Examination”, “Introduction to the New HSK Exam” and “Chinese Textbook Analysis”. 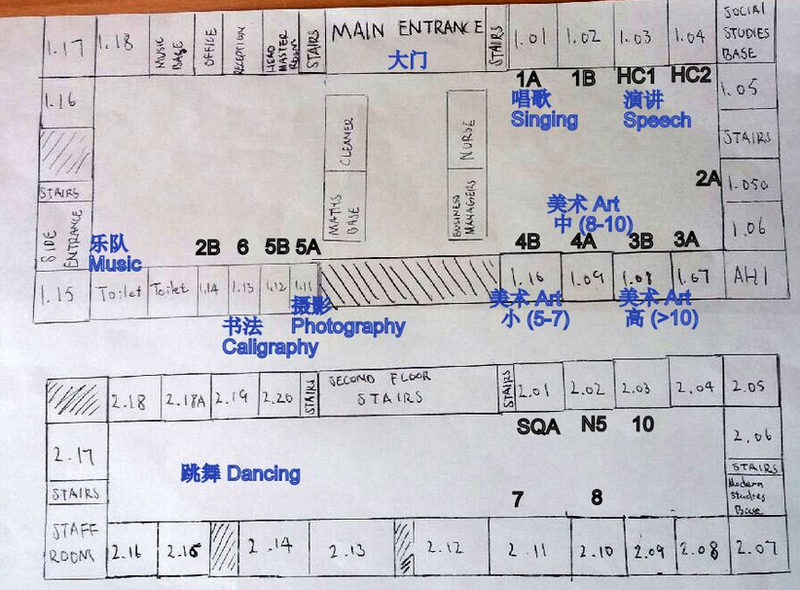 On 4th Jun of 2016, about 30 pupils and their teachers from the Edinburgh Alba Cathay Chinese School took part in the Summer Fair of Sciennes Primary School, which was organised by its PTA; The theme of this year is Multi-cultural ism. Apart from running Calligraphy workshop, we also provided energetic folk dance and wonderful chamber music performance which has the flavor of Chinese and western melodies. All were very popular and successful. It is another charitable and meaningful cultural event supported by our community. On February 13, about 260 people including teachers, students, parents of our school and guests from other Chinese organizations attended our school’s 2016 New Year Celebration in the atrium. At the party, our students presented a wonderful stage performance. The program comprised children choir, poetry recitation, drama, lion dance, Chinese dance, musical instruments (piano, violin, Bagpipe). After the show, the children participated in the traditional Chinese New Year fun activities including riddles, calligraphy, crafts, Chinese knot. It was a wonderful experience for our children to appreciate the Chinese culture and tradition. 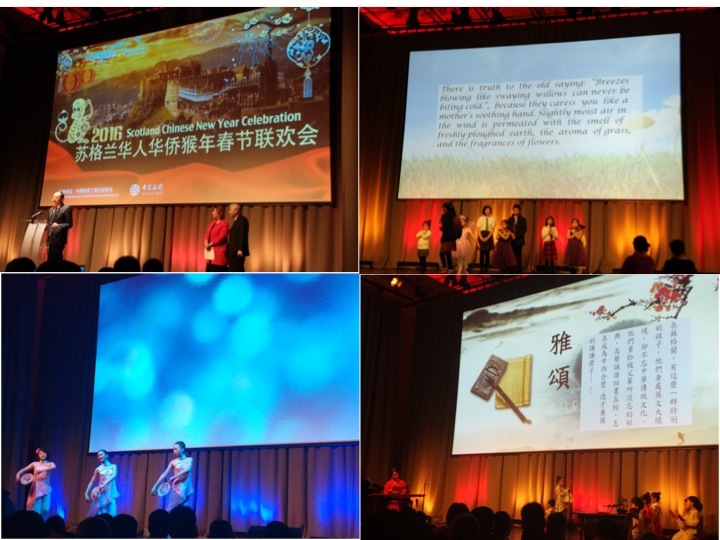 On February 7th, the first Scotland Chinese New Year Celebration was held in the Assembly Rooms in Edinburgh. Students from our school were invited to perform poetry recitation of “Spring”, a masterpiece of famous writer Zhu Ziqing. Their performance won the audience’s applause. 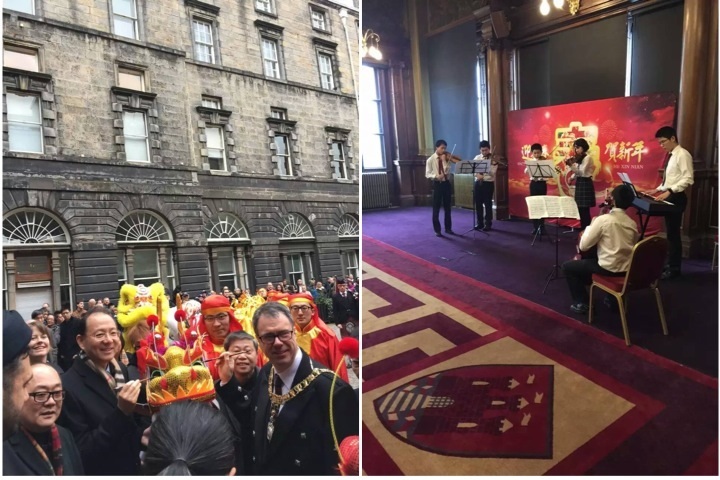 On February 6th, teachers and students from our school were invited to the Edinburgh City Chamber to the Chinese New Year reception. Mayor Donald Wilson, the Consul General of the People’s Republic of China Consulate General in Edinburgh Mr. Pan Xinchun, diplomats from many countries and representatives from local communities attended this event. Students from our school contributed a wonderful program to the reception. SQA class performed dragon dance. The school band played the piece of “New Spring”, bringing a full festival atmosphere. The choir students and parents sang “Auld Lang Syne” and other songs. 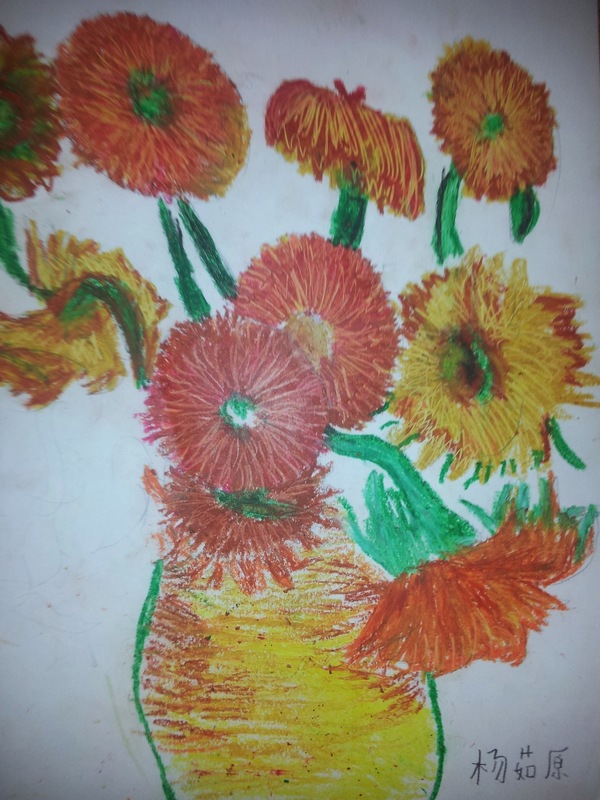 ACCS pupil Yang RuYuan has won the bronze prize with her copy art work “Sunflowers” in the 5th “ShouKai Cup” Painting and Calligraphy Competition for overseas Chinese pupils, which are hosted by the Beijing Municipal Overseas Affairs Bureau. ACCS teacher Mr Yao Hui has won the Outstanding Guidance Teacher award. The school has also been awarded the Outtstanding Organisational Achievement in the competition. On September 22nd at the Confucius Institute for Scotland in Edinburgh University, two members of board of trustee Mrs Zou Juan and Mrs Guo Huijie presented Dr. Jin Ri the appointment letter of the honorary trustee of Alba Cathay Chinese School. Dr. Jin and Confucius Institute have been a great support to our school over the past years. We trust this new relationship will bring new momentum in Chinese learning and culture activities to the school. On 30th of August, 10 children from ACCS performed the classic Chinese dance “MU LAN” at the Mela of Edinburgh Festival 2015. 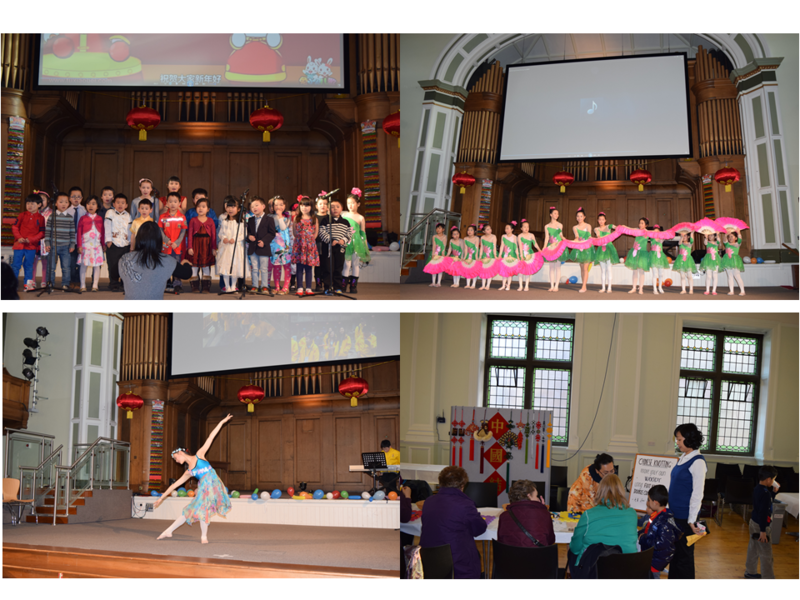 On February 21, about 400 people including teachers, students, parents of our school and guests from other Chinese organizations attended our school’s 2015 New Year Celebration at Central Hall, Tollcross. At the party, our students and performers from other Chinese organizations presented a wonderful stage performance. The program comprised children choir, poetry recitation, drama, Chinese dance, street dance, Chinese musical instruments (harp, zither). After the show, the children participated in the traditional Chinese New Year fun activities including riddles, calligraphy, crafts, Chinese knot. They also tasted dumplings and spring rolls and other Chinese traditional Spring Festival food. Well done, ACCS boys and girls! 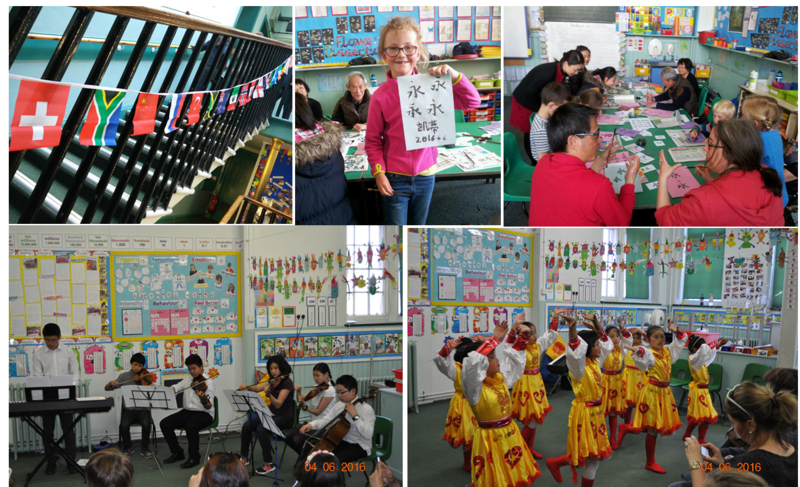 Our school had a great success in the 2014 Talent Contest on the Chinese Culture. Six pupils from our school were shortlisted after the semi-final (Scotland). They are He Lisha, Li Yijiao, Li Yuchen, Zeng Tianxiang, Deng Zichu, Shen Yu. In December, they flied to Xiamen, China as members of the British team and took part in the finals of the Third Overseas Chinese Youth Talent Contest in the Chinese Culture from December 19 to 30. 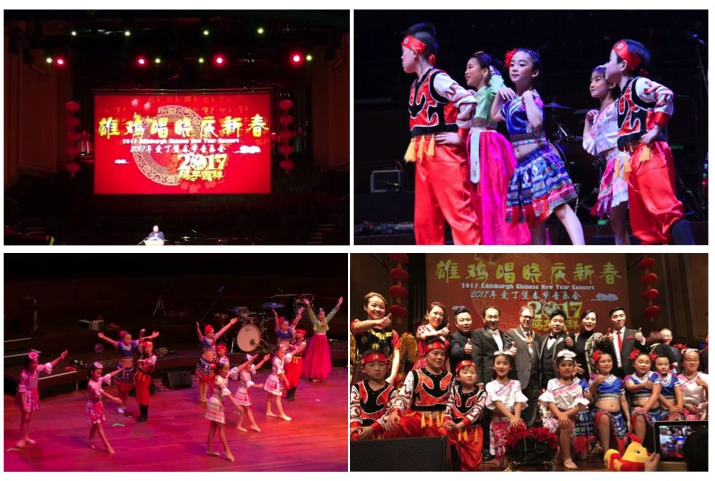 During the 11-day contest, they competed against over 200 peers from the world in knowledge of Chinese culture, instrumental music, recitation and dance. Zeng Tianxiang (Class 8, 13 years old) performed well in the speech contest, finished third and won a prize of ¥2000. 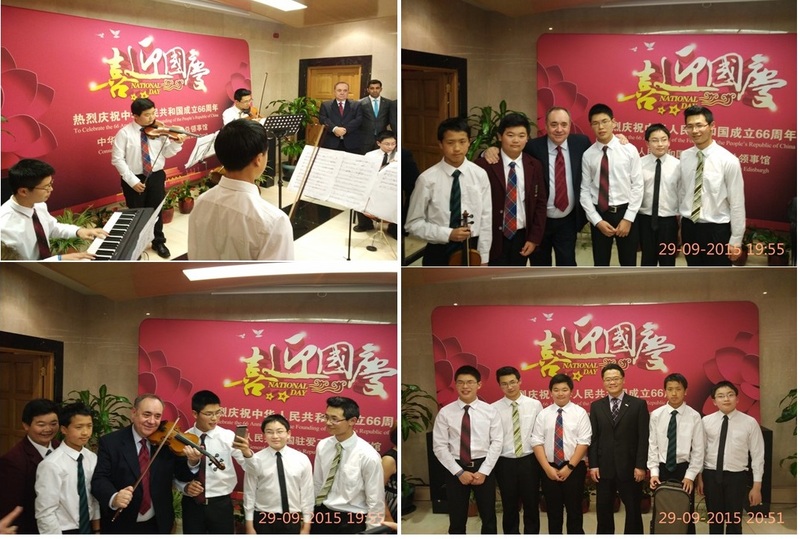 Li Yi Jiao (SQA class, 16 years old) won the sixth place in the intensive competition in Chinese instrumental music. They made a history for the British team to won awards for the first time. December 7-8, Dr. Zeng Zhiqiang , Secretary of the School Committee, attended ” The Third International Conference on Chinese Education” in Beijing. The Overseas Chinese Affairs Office of the State Council organized the conference. More than 500 representatives from home and abroad attended the meeting. The opening ceremony was held in the Great Hall. 38 overseas Chinese schools around the world including our school, were awarded ” Model Schools of Chinese Education ” plaques. During the two days of the conference, the delegates took part of group discussions, forums and other forms of information exchange and discussion with the theme “Promoting Chinese education, revitalizing Chinese schools”.December 13th, the school invited alumnus Mr Tai ZiHao, who is currently studying medicine at Oxford University, to come and give a talk on university application. The talk was very informative, the process of application, interview skills and personal statement preparation, etc. are all well articulated. Over 30 pupils and parents attended the talk and the Q&A session afterwards. On 8th of November, Consul General Pan Xinchun and Consul Shen Dechun, from the People’s Republic of China Consulate General in Edinburgh, paid a visit to our school. Mr. Pan had a short meeting with members of the School Board of Trustees and the School Management Committee. Headmaster Dr Li Ke gave a brief on the history, teaching, facilities and achievements of our school. Mr Pan expressed his appreaciation to our efforts in teaching Chinese language and Chinese cultures despite of limited resources. He encourged our school not only to spread traditional Chinese culture, but also to introduce the remarkable achievements of modern China to our young generations. After the meeting, the Consul general toured classrooms and met some teachers and students. From 24th to 26th October, an autumn camp with the theme of Fujian culture took place at our school. During the two and a half days, children from the Alba Cathay Chinese School, Edinburgh Chinese School, Glasgow Chinese School and Dundee Chinese School experienced and appreciated the Fujian Culture by attending the “Chinese Painting and Calligraphy”, “Fujian paper-cut,” “Southern Shaolin Martial Arts”, “classic reading ” and “Fujian tea appreciation” classes. 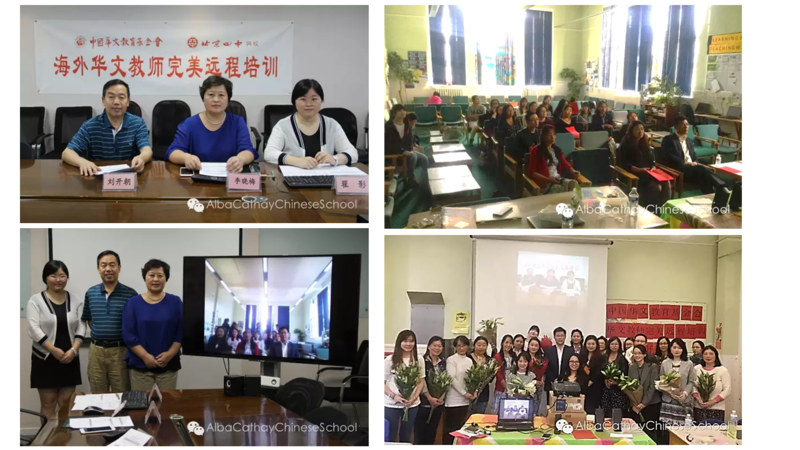 This autumn camp was organized by the Foundation of Chinese Education of China, the Centre for Overseas Chinese Education of Fujian Province and the UK Association of Promotion of Chinese Education (UKAPCE), It was hosted by the Alba Cathay Chinese School. The school resumes on the 6th of Sept. Admission of new pupils is now closed. Registration for existing pupils is now open. For registration, please use this link. On July 20, twenty children from ACCS performed the dance “Terracotta Army” at the Opening Ceremony of Edinburgh Festival 2014. ACCS co-organised the UKAPCE annual Reading competition in Scotland. 68 of our pupils participated total 30 events, together they’ve won 10 First Class Winner Certificates; 25 Second Class Certificates and 33 Third Class Certificates. To add to the celebration of the school’s 20th anniversary, ACCS has been given the prestiges award of “Model School for Chinese Education” by the Overseas Chinese Affairs Office of the PRC State Council. 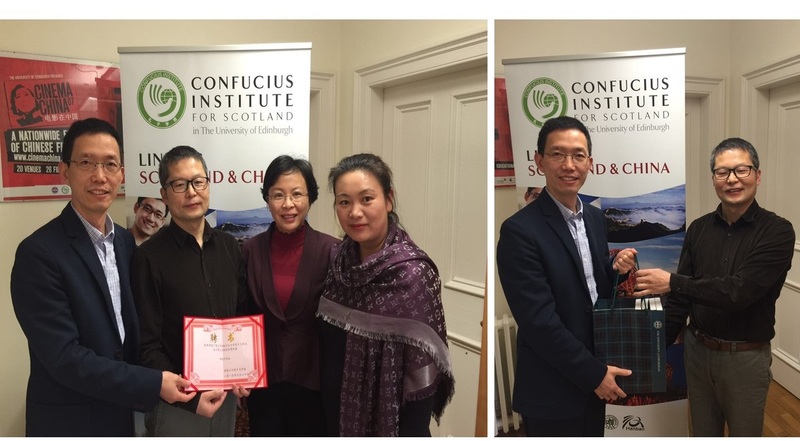 On the April the third, ACCS headmaster Dr Ke Li accepted the award from the Counsel General Pan at the Chinese Consulate in Edinburgh. This award is the recognition of the school’s achievements in Chinese education in the last 20 years and will greatly boost our efforts in building a better school. 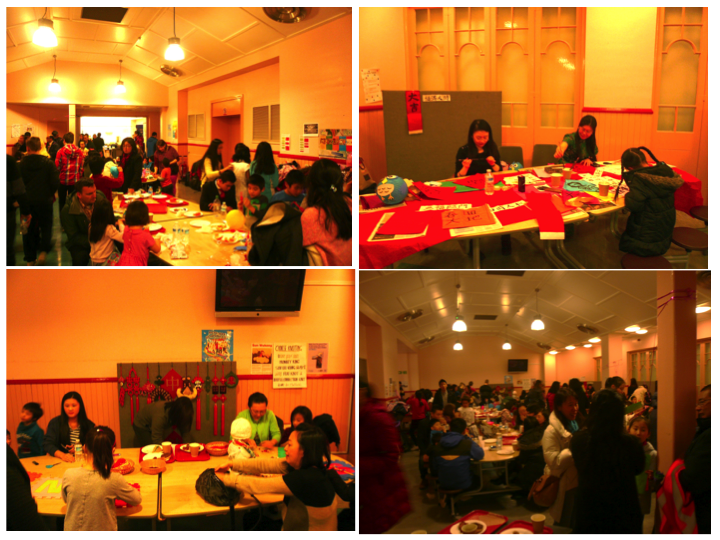 ACCS is holding a Chinese New Year and 20 years anniversary celebration party at Central Hall on the 8th of February 2014. 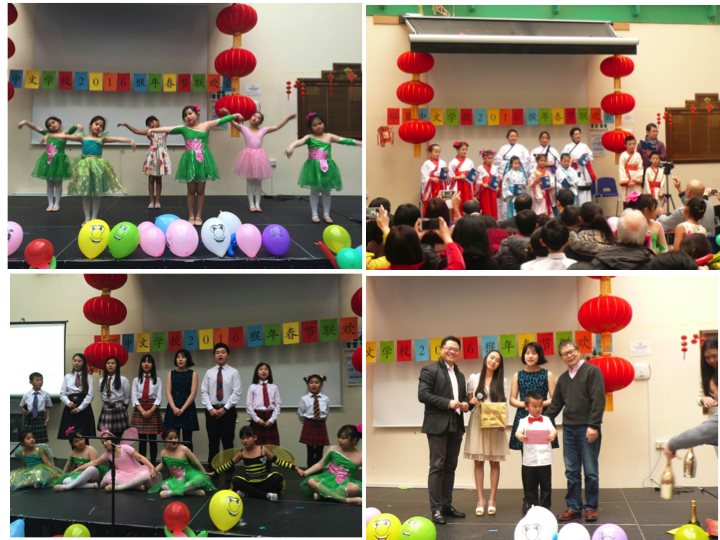 Deputy Consul General Mr Zhang Huazhong and other honorable guests from the local communities came together to enjoy the special time and great performances put together by our pupils and friends. 20 years of commitment of the parents, children and countless volunteers. In this great anniversary, we are celebrating not only the great accomplishments achieved by the hard work of our children and teachers but also the spirit of giving and sacrifices which bound us together so well for so long. May the year of horse bring everybody good health and every success you worked hard for. May it also bring energy, prosperity and most of all, great spirits and harmony to our community. ACCS “HuaXing” library is formally open to the teaching staff. HuaXing library has reference books, multi-media materials and Chinese literatures, which will help us deliver high quality, most effective Chinese learning experiences to our pupils. HuaXing library include all the books sponsored by the Chinese Affairs Office of the PRC State Council and Confucius Institute in Edinburgh University.